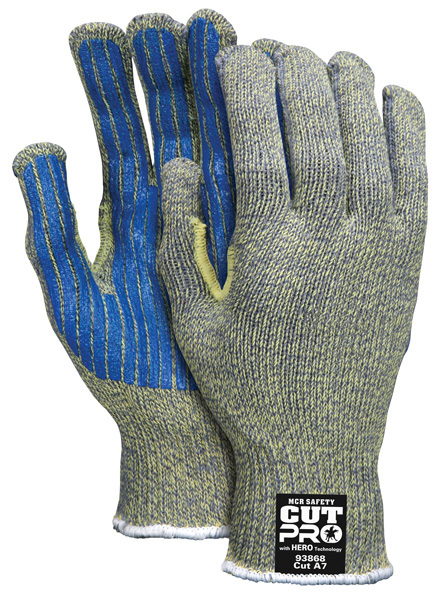 This MCR Safety Cut Pro™ glove with Hero™ Technology is made of a high performance cut resistant material that achieves high levels of cut and comfort. The blended Kevlar®, stainless steel, and other fibers are used for general purpose work applications to provide cut and abrasion resistance when working with sharp objects. Some styles are stripped or dotted to provide a better grip and increase durability. The 93868 has PVC stripes added to the palm side for additional grip and abrasion resistance.